Eduardo da Silva of Arsenal is back and is looking sharp. What a great comeback story! 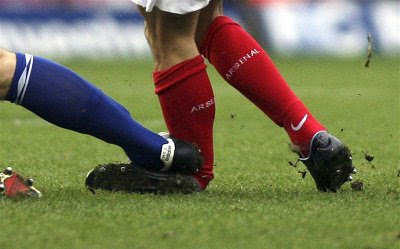 After fracturing his left fibula and dislocating his ankle in a tackle by Birmingham's Martin Taylor in February 2008, he is now back and played yesterday in Arsenal's fourth-round replay against Cardiff in the FA Cup. He started for the Gunners and never gave anyone a doubt about his readiness to play again. He scored the first goal of the match in the 20th minute. 25-year-old Eduardo da Silva, who also plays for Croatia, said, "It was the best day of my life - it was a special moment to score, very emotional. I celebrated by kissing my wedding ring - because my wife and daughter and family supported me through this." He did not only score once but twice. The Brazilian-born Croat easily dispatched the ball in the left-hand corner of the goal in a 60th minute penalty kick, causing another round of celebration from Arsenal fans. I feel very happy and excited for him, seeing how good he plays and the future he has in his football career. I hope the best for Eduardo da Silva and may he continue to inspire football fans with his great talent, determination and heart! Eduardo da Silva is back! Ouch! It's amazing if he totally recovered from that!